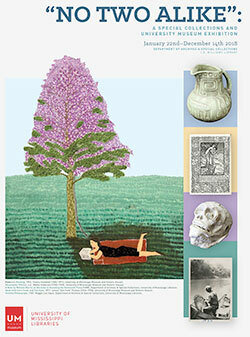 Collection includes broadsides, correspondence, manuscripts, newspapers, pamphlets, and audiovisual materials. of individuals present during the integration of the University of Mississippi. of the University of Mississippi. Encoded by Kathryn Michaelis, September 2011, and Susan Ivey, June 2014. The Open Doors Collection is open for research. or reproduction for purposes in excess of “fair use”, that user may be liable for copyright infringement. A majority of materials were acquired during the Open Doors events of September-October 2002. For more University of Mississippi Archives & Special Collections Civil Rights materials, see our Civil Rights & Race Relations subject guide. For more materials concerning the University of Mississippi, housed in the Archives & Special Collections, see our University of Mississippi subject guide. Audiovisual materials have been digitized. Masters located in Annex cold storage. Folder 1: Photocopy. Jesse Dale Jordan, Deputy U.S. Marshal, So. District of Indiana to Chief U.S. Marshal James McShane. Squadron, 108th Armored Cavalry Regiment, MS. National Guard, regarding the University of Mississippi Riot. Donated by M.C. the integration of the University of Mississippi. Donated by Karl Gottschalk. Folder 6: Broadside. . “Ole Miss POW” sign. Donated by Karl Gottschalk. Hale’s experiences as a member of the Mississippi National Guard involved in the 1962 integration of the University of Mississippi. Folder 11: Recollections of Jerry L. Stephens. 501st Airborne Division on the University of Mississippi campus, Fall 1962. Mississippi and racism, and the Dahmer Family. Donated by J. Ralph Noonhester. Folder 14: “The Ole Miss Crisis, 1962″/ John Autry. 3pp. Recollections of the 1962 events. Donated by John Autry. legislature role in integration and civil rights. Donated by Joe Wroten. Folder 19: “Ole Miss as I Saw Her”/ Gene Maughan. 8pp. Article recounting the night of the riot. Donated by Gene Maughan. Folder 20: Copies of materials and letter from J. Kimbrough Johnson. Collected letters and propaganda regarding riot and integration. Folder 21: Copies of articles and letter from Jimmy Robinette, 503d Military Police, during the riot. Donated by Jimmy Robinette. Folder 22: “The Admission of James Howard Meredith” / Compiled by Dr. David Sansing. 4pp. Folder 26: Invitation list for Open Doors event. Folder 27: Promotional materials for Open Doors. Folder 28: “You in 1962” Promotional Leaflet. Printed for Open Doors event. Folder 29: Open Doors Background Materials Kit. RESTRICTED. Financial data concerning Open Doors events. Folder 30: News articles about Open Doors Events. Folder 31: Oral Histories participant List and interview questions. Doors General Information. Some letters contain brief histories and recounts of 1962 events. Folder 1: Financial data concerning Open Doors events. Box 4: MiniDV’s — Oral Histories. See Open Doors Digital Collection. These materials are located in the Library Annex. Box 5: Cassettes — Oral Histories. (recordings of MiniDV’s). See Open Doors Digital Collection.